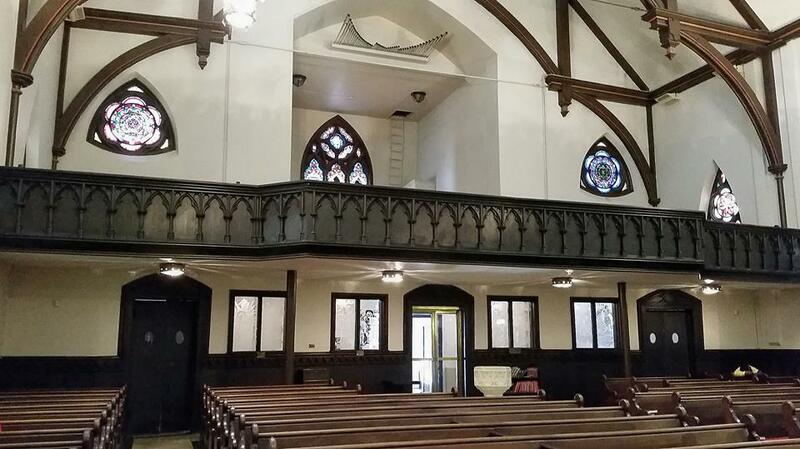 Dating back to January of 1842 when an organizational meeting was held, and when the first service was conducted later that same month, the Church of the Epiphany has been steeped in history. 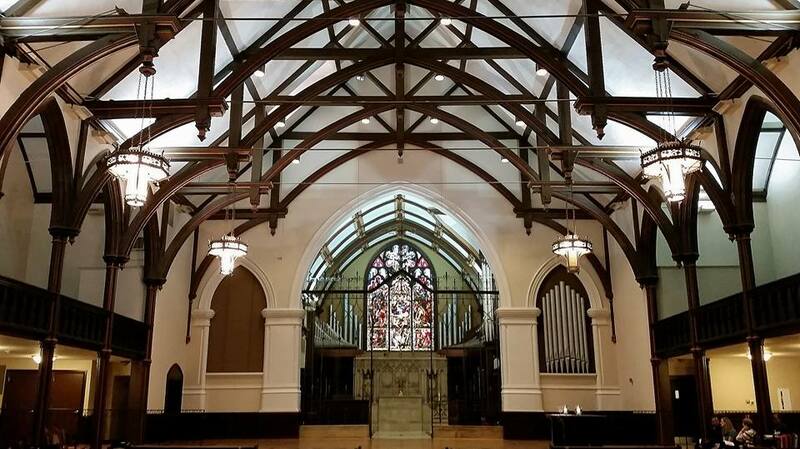 Construction of the church’s Gothic Revival building, which is listed on the National Register of Historic Places, began with the laying of the cornerstone the follow year, and was completed in 1844, the same year parish status was achieved. One of the only remaining pre-Civil War churches in the city, people have been worshipping and praying there every day for over a century and a half. And the building has stayed much the same over those years, although the surrounding downtown neighborhood has developed considerably from the quiet, tree shaded, and residential neighborhood it was when the church began. Today, the church’s slim shape and stone façade stand out amongst the towering, modern downtown office buildings which surround it. Throughout its history, prominent people have always attended and been a part of the Church of the Epiphany. Before the Civil War, a number of prominent politicians, including future Confederate President Jefferson Davis, were members of the congregation. After the war broke out, President Abraham Lincoln’s Secretary of War, Edward Stanton began attending, along with Union service members. And in 1862, President Abraham Lincoln attended a funeral for Union Army General Frederick Lander at Epiphany. But the Church of the Epiphany has always had ties to the common man as well. Between July and December of1862, the building was a temporary hospital, with wooden boards laid across the tops of pews to create beds for the wounded. During the time since the Civil War, other presidents have come to Epiphany Church as well. A memorial services was held for slain President William McKinley in 1901, and since 1925, the church has rung its bells in honor of each newly inaugurated president. President Franklin Delano Roosevelt also attended a service at Epiphany, at Christmas in 1942. 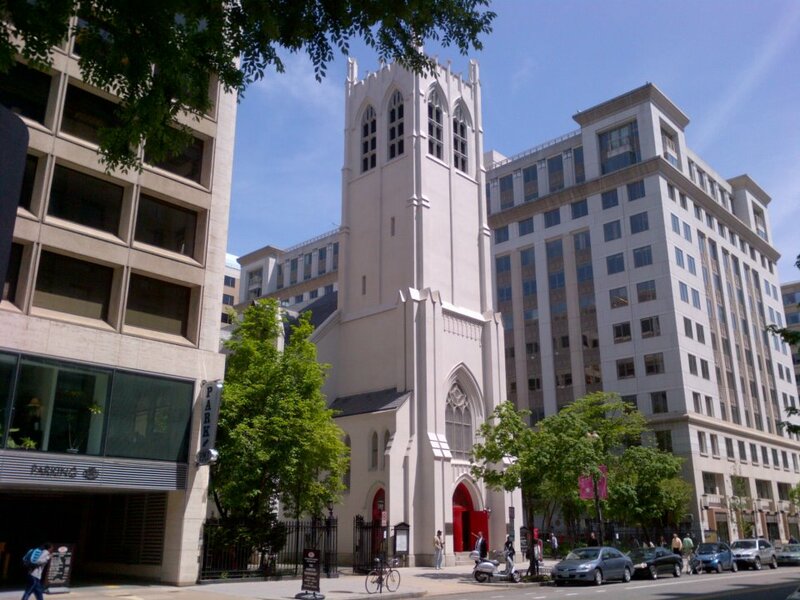 On today’s bike ride, I stopped by the historic Episcopal church, which is located at 1317 G Street in northwest D.C. (MAP), just two blocks from The White House. And I was please to discover that the church is as relevant today as it has been throughout its history. Today, the Church of the Epiphany remains an active, urban church that continues to adapt to the ever changing needs of the place where it was planted, with its small parish of about 350 diverse worshipers focused largely on serving, helping and supporting the surrounding homeless community. 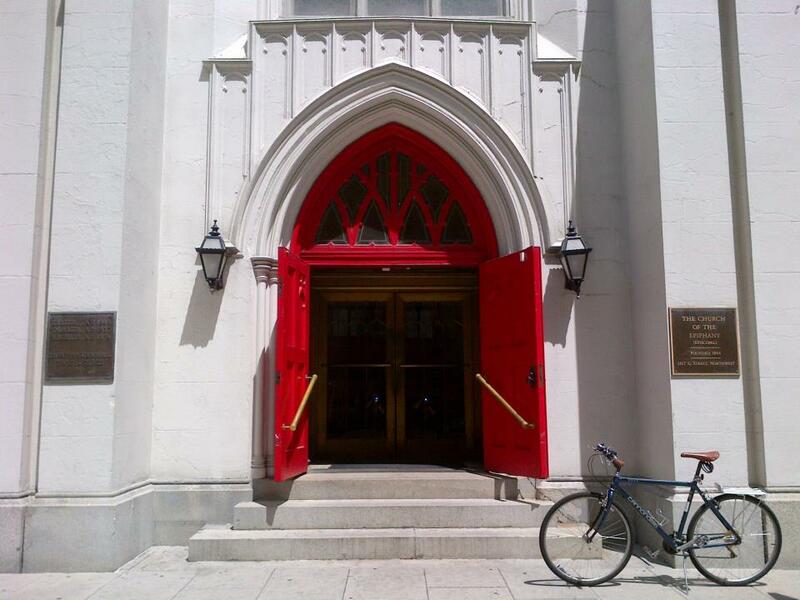 Through its brightly colored and welcoming doors, the church houses “The Welcome Table” ministry to feed the hungry. It also hosts weekly Narcotics Anonymous meetings, and has a licensed addiction counselor and an outreach ministry to assist downtown poor in obtaining information about housing, medical aid, employment and treatment facilities. The church also operates the Epiphany Mission Center, where meetings and retreats are held. But the church also ventures out from the building it calls home, with a “Street Church’ ministry that gathers at Franklin Square Park for worship and lunch with around 40-60 downtown poor and visitors every Tuesday. Through these and other programs, the Church of the Epiphany ensures that it is not just part of history, but will continue to make history as well. 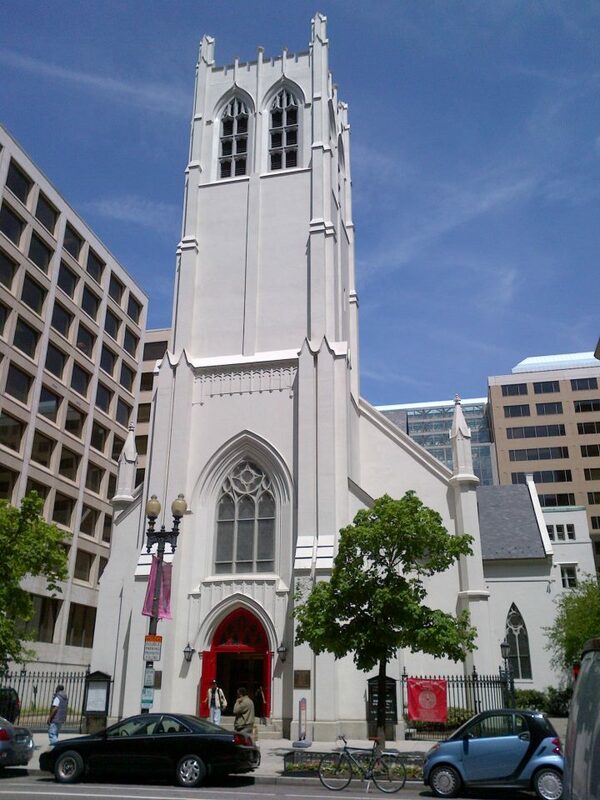 I’ve passed this church a lot on D.C walks…nice to know a bit of history/information about it now!